Television (or TV) (from the Greek tele, meaning "far," and the Latin visio, meaning "sight") is a telecommunication system for broadcasting and receiving moving pictures and sound over long distances. The term has come to refer to all aspects of the system, from the receiver set to the programming and transmission. With the growth and influence of the television industry, it is not surprising that TV sets rank among consumer goods purchased most often, and the number of sets sold per year is used as an economic indicator. Almost every household in the United States has at least one television set. The average household might have two or three, with a set even in the bathroom. 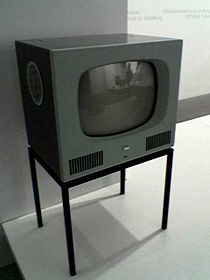 A Belweder TV set (OT-1471), Poland, 1957. The television was not invented by a single person, but by a number of scientists' advancements contributing to the ultimate all-electronic version of the invention. The origins of what would become today's television system can be traced back as far as the discovery of the photoconductivity of the element selenium by Willoughby Smith in 1873 followed by the work on the telectroscope and the invention of the scanning disk by Paul Nipkow in 1884. All practical television systems use the fundamental idea of scanning an image to produce a time series signal representation. That representation is then transmitted to a device to reverse the scanning process. The final device, the television (or T.V. set), relies on the human eye to integrate the result into a coherent image. Electromechanical techniques were developed from the 1900s into the 1920s, progressing from the transmission of still photographs to live still duotone images to moving duotone or silhouette images, with each step increasing the sensitivity and speed of the scanning photoelectric cell. John Logie Baird gave the world's first public demonstration of a working television system that transmitted live moving images with tone graduation (grayscale) on January 26, 1926, at his laboratory in London, and built a complete experimental broadcast system around his technology. Baird further demonstrated the world's first color television transmission on July 3, 1928. Other prominent developers of mechanical television included Charles Francis Jenkins, who demonstrated a primitive television system in 1923, Frank Conrad who demonstrated a movie-film-to-television converter at Westinghouse in 1928, and Frank Gray and Herbert E. Ives at Bell Labs who demonstrated wired long-distance television in 1927 and two-way television in 1930. Color television systems were invented and patented even before black-and-white television was working. 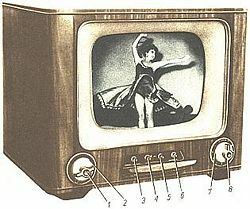 Completely electronic television systems relied on the inventions of Philo Taylor Farnsworth, Vladimir Zworykin and others to produce a system suitable for mass distribution of television programming. Farnsworth gave the world's first public demonstration of an all-electronic television system at the Franklin Institute in Philadelphia on August 25, 1934. Regular broadcast programming occurred in the United States, the United Kingdom, Germany, France and the Soviet Union before World War II. The first regular television broadcasts with a modern level of definition (240 or more lines) were made in England in 1936, soon upgraded to the so-called "System A" with 405 lines. Regular network broadcasting began in the United States in 1946, and television became common in American homes by the middle 1950s. While North American over-the-air broadcasting was originally free of direct marginal cost to the consumer (cost in excess of acquisition and upkeep of the hardware) and broadcasters were compensated primarily by receipt of advertising revenue, increasingly United States television consumers obtain their programming by subscription to cable television systems or direct-to-home satellite transmissions. In the United Kingdom, France, and most of the rest of Europe, on the other hand, operators of television equipment must pay an annual license fee, which is usually used to fund (wholly or partly) the appropriate national public service broadcasters (British Broadcasting Corporation, France Télévisions, and so forth). Practical television systems include equipment for selecting different image sources, mixing images from several sources at once, insertion of pre-recorded video signals, synchronizing signals from many sources, and direct image generation by computer for such purposes as station identification. Transmission may be over the air from land-based transmitters, over metal or optical cables, or by radio from synchronous satellites. Digital systems may be inserted anywhere in the chain to provide better image transmission quality, reduction in transmission bandwidth, special effects, or security of transmission from reception by non-subscribers. CRT (Cathode Ray Tube): The most common screens are direct-view CRTs for up to 40 inches (100 centimeters) (in 4:3) and 46 inches (115 centimeters) (in 16:9) diagonally. These are the least expensive and are a refined technology that can still provide the best value for overall picture quality. As they do not have a fixed native resolution, they are capable of displaying sources with a variety of different resolutions at the best possible image quality. The frame rate or refresh rate of a typical NTSC format CRT TV is 60 Hz, and for the PAL format, is 50 Hz. A typical NTSC broadcast signal's visible portion has an equivalent resolution of about 640 by 480 pixels. It actually could be slightly higher than that, but the Vertical Blanking Interval, or VBI, allows other signals to be carried along with the broadcast. Rear projection: Most very large screen TVs (up to over 100 inches (254 cm)) use projection technology. 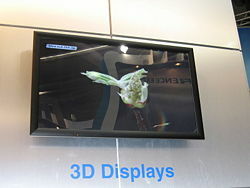 Three types of projection systems are used in projection TVs: CRT-based, LCD-based, and DLP (reflective micromirror chip) -based. 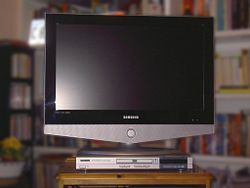 Projection television has been commercially available since the 1970s, but at that time could not match the image sharpness of the CRT; current models are vastly improved, and offer a cost-effective large-screen display. A variation is a video projector, using similar technology, which projects onto a screen. Flat panel (LCD or plasma): Modern advances have brought flat panels to TV that use active matrix LCD or plasma display technology. Flat panel LCDs and plasma displays are as little as one inch thick and can be hung on a wall like a picture or put over a pedestal. Some models can also be used as computer monitors. LED technology has become one of the choices for outdoor video and stadium uses, since the advent of ultra high brightness LEDs and driver circuits. LEDs enable scalable ultra-large flat panel video displays that other existing technologies may never be able to match in performance. Each has its pros and cons. Flat panel LCD displays can have narrow viewing angles and so may not suit a home environment. Rear projection screens do not perform well in natural daylight or well-lit rooms and thus are best suited to dark viewing areas. Pixel resolution is the amount of individual points known as pixels on a given screen. A typical resolution of 720 by 480 means that the television display has 720 pixels across and 480 pixels on the vertical axis. The higher the resolution on a specified display the sharper the image. Contrast ratio is a measurement of the range between the brightest and darkest points on the screen. The higher the contrast ratio, the better looking picture there is in terms of richness, deepness, and shadow detail. The brightness of a picture measures how vibrant and impacting the colors are. Measured in equivalent to the amount of candles required to power the image. There are various bands on which televisions operate depending upon the country. The VHF and UHF signals in bands III to V are generally used. Lower frequencies do not have enough bandwidth available for television. Although the BBC initially used Band I VHF at 45 MHz, this frequency is no longer in use for this purpose. Band II is used for FM radio transmissions. Higher frequencies behave more like light and do not penetrate buildings or travel around obstructions well enough to be used in a conventional broadcast TV system, so they are generally only used for satellite broadcasting, which uses frequencies around 10 GHz. TV systems in most countries relay the video as an AM (amplitude-modulation) signal and the sound as a FM (frequency-modulation) signal. An exception is France, where the sound is AM. Aspect ratio refers to the ratio of the horizontal to vertical measurements of a television's picture. Mechanically scanned television as first demonstrated by John Logie Baird in 1926 used a 7:3 vertical aspect ratio, oriented for the head and shoulders of a single person in close-up. Most of the early electronic TV systems from the mid-1930s onward shared the same aspect ratio of 4:3, which was chosen to match the Academy Ratio used in cinema films at the time. 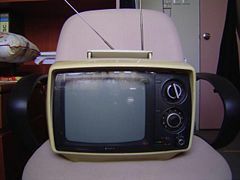 This ratio was also square enough to be conveniently viewed on round cathode-ray tubes (CRTs), which were all that could be produced given the manufacturing technology of the time (today's CRT technology allows the manufacture of much wider tubes, and the flat-screen technologies which are becoming steadily more popular have no technical aspect ratio limitations at all). The BBC's television service used a more squarish 5:4 ratio from 1936 to April 3, 1950, when it too switched to a 4:3 ratio. This did not present significant problems, as most sets at the time used round tubes which were easily adjusted to the 4:3 ratio when the transmissions changed. In the 1950s, movie studios moved towards widescreen aspect ratios such as CinemaScope in an effort to distance their product from television. Although this was initially just a gimmick, widescreen is still the format of choice today and square aspect ratio movies are rare. Some people argue that widescreen is actually a disadvantage when showing objects that are tall instead of panoramic, others say that natural vision is more panoramic than tall, and therefore widescreen is easier on the eye. The switch to digital television systems has been used as an opportunity to change the standard television picture format from the old ratio of 4:3 (1.33:1) to an aspect ratio of 16:9 (approximately 1.78:1). This enables TV to get closer to the aspect ratio of modern widescreen movies, which range from 1.66:1 through 1.85:1 to 2.35:1. There are two methods for transporting widescreen content, the better of which uses what is called anamorphic widescreen format. This format is very similar to the technique used to fit a widescreen movie frame inside a 1.33:1 35 millimeter film frame. The image is compressed horizontally when recorded, then expanded again when played back. The anamorphic widescreen 16:9 format was first introduced via European PALPlus television broadcasts and then later on "widescreen" DVDs; the ATSC HDTV system uses straight widescreen format, no horizontal compression or expansion is used. Widescreen spread from television to computing where both desktop and laptop computers are commonly equipped with widescreen displays. There are some complaints about distortions of movie picture ratio due to some DVD playback software not taking account of aspect ratios, but this may subside as the DVD playback software matures. Furthermore, computer and laptop widescreen displays are in the 16:10 aspect ratio both physically in size and in pixel counts, and not in 16:9 of consumer televisions, leading to further complexity. This was a result of widescreen computer display engineers' uninformed assumption that people viewing 16:9 content on their computer would prefer that an area of the screen be reserved for playback controls, subtitles or their taskbar, as opposed to viewing content full-screen. The television industry's changing of aspect ratios is not without difficulties, and can present a considerable problem. A common compromise is to shoot or create material at an aspect ratio of 14:9, and to lose some image at each side for 4:3 presentation, and some image at top and bottom for 16:9 presentation. In recent years, the cinematographic process known as Super 35 (championed by James Cameron) has been used to film a number of major movies such as Titanic, Legally Blonde, Austin Powers, and Crouching Tiger, Hidden Dragon. This process results in a camera-negative which can then be used to create both wide-screen theatrical prints, and standard full screen releases for television/VHS/DVD which avoid the need for either "letterboxing" or the severe loss of information caused by conventional "pan-and-scan" cropping. The sound provided by television was originally was similar to monophonic radio. Original televisions that were sold to the public were a small box that showed the image and was attached to a radio. One technique for sound is called a simulcast (simultaneous broadcast) where the sound is broadcast on radio while the video is broadcast on television. Some television stations use FM band to broadcast their sound. With televisions becoming more advanced, it is now quite common to have them with built in stereo. Many televisions today have stereo jacks so people can attach amplifiers to the television for better sound. Today there are many television add-ons including video game consoles, VCRs, set-top boxes for cable television, satellite and DVB-T compliant digital television reception, DVD players, or digital video recorders (including personal video recorders, PVRs). The add-on market continues to grow as new technologies are developed. 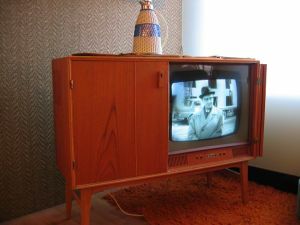 In the early days of television, the cabinet was made of wood grain; however, the wood grain began to disappear in the 1980s, being replaced by streamlined plastic exteriors. Since their inception in the U.S. in 1940, TV commercials have become one of the most effective, most pervasive, and most popular methods of selling products of many sorts, especially consumer goods. Advertising rates in the U.S. are determined primarily by Nielsen Ratings. Original Run or First Run—a producer creates a program of one or multiple episodes and shows it on a station or network which has either paid for the production itself or to which a license has been granted by the producers to do the same. Syndication—this is the terminology rather broadly used to describe secondary programming usages (beyond original run). It includes secondary runs in the country of first issue, but also international usage which may or may not be managed by the originating producer. In many cases other companies, TV stations or individuals are engaged to do the syndication work, in other words to sell the product into the markets they are allowed to sell into by contract from the copyright holders, in most cases the producers. In most countries, the first wave occurs primarily on free-to-air (FTA) television, while the second wave happens on subscription TV and in other countries. In the U.S., however, the first wave occurs on the FTA networks and subscription services, and the second wave travels via all means of distribution. First-run programming is increasing on subscription services outside the U.S., but few domestically produced programs are syndicated on domestic FTA elsewhere. This practice is increasing however, generally on digital-only FTA channels, or with subscriber-only first run material appearing on FTA. Unlike the U.S., repeat FTA screenings of a FTA network program almost only occur on that network. Also, affiliates rarely buy or produce non-network programming that isn't centered around local events. Almost since the medium's inception there have been charges that some programming is, in one way or another, inappropriate, offensive, or indecent. Critics such as Jean Kilborne have claimed that television, as well as other mass media images, harm the self image of young girls. Other commentators, such as Sut Jhally, make the case that television advertising in the U.S. has been so effective that happiness has increasingly come to be equated with the purchase of products. George Gerbner has presented evidence that the frequent portrayals of crime, especially minority crime, has led to the Mean World Syndrome, the view among frequent viewers of television that crime rates are much higher than the actual data would indicate. In addition, a lot of television has been charged with presenting propaganda, political or otherwise, and being pitched at a low intellectual level. Paralleling television's growing primacy in family life and society, an increasingly vocal chorus of legislators, scientists, and parents is raising objections to the uncritical acceptance of the medium. Fifty years of research on the impact of television on children's emotional and social development demonstrated that there are clear and lasting effects of viewing violence. In a study published in February 2006, the research team demonstrated that the brain activation patterns of children viewing violence show that children are aroused by the violence (increased heart rates), demonstrate fear (activation of the amygdala, the "fight or flight" sensor in the brain) in response to the video violence, and store the observed violence in an area of the brain (the posterior cingulate) that is reserved for long-term memory of traumatic events. An article in Scientific American suggested that compulsive television watching, television addiction, was no different from any other addiction, a finding backed up by reports of withdrawal symptoms among families forced by circumstance to cease watching. A longitudinal study in New Zealand involving one thousand people (from childhood to 26 years of age) demonstrated that "television viewing in childhood and adolescence is associated with poor educational achievement by 26 years of age." In other words, the more the child watched television, the less likely he or she was to finish school and enroll in a university. In Iceland, television broadcasting hours were restricted until 1984, with no television programs being broadcast on Thursday, or during the whole of July. Also, the Swedish government imposed a total ban on advertising to children under 12 in 1991. Despite this research, some media scholars have dismissed the studies as flawed. In its infancy, television was an ephemeral medium. Fans of regular shows planned their schedules so that they could be available to watch their shows at their time of broadcast. The term “appointment television” was coined by marketers to describe this kind of attachment. The viewership's dependence on schedule lessened with the invention of programmable video recorders, such as the videocassette recorder and the digital video recorder. Consumers could watch programs on their own schedule once they were broadcast and recorded. Television service providers also offer video on demand, a set of programs which could be watched at any time. Both mobile phone networks and the Internet are capable of carrying video streams. There is already a fair amount of Internet TV available, either live or as downloadable programs. ↑ Donna L. Halper, “How Television Came to Boston: The Forgotten Story of W1XAY.” TVhistory.tv. Retrieved May 29, 2007. ↑ H. A. Layer, “Charles Francis Jenkins television station W3XK. Retrieved May 29, 2007. ↑ J. L. Baird: Television in 1934. Bairdtelevision.com. Retrieved May 29, 2007. ↑ Joan Bleicher, Museum of Broadcast Communications: Germany. Retrieved May 29, 2007. ↑ 1936 German (Berlin) Olympics. TVhistory.tv. Retrieved May 29, 2007. ↑ R. W. Burns, Television: An International History of the Formative Years (IET, 1998, ISBN 0852969147), 488. ↑ James O’Neal, RCA's Russian Television Connection. Retrieved May 29, 2007. ↑ Norma Pecora, John P. Murray and Ellen A. Wartella, Children and Television: 50 Years of Research (Lawrence Erlbaum Associates, 2006, ISBN 0805841393). ↑ Media Psychology 8 (1): 25-37. ↑ Robert Kubey and Mihaly Csikszentmihalyi, “Television Addiction is no Mere Metaphor.” Scientific American (January, 2004). Retrieved May 29, 2007. ↑ David Gauntlett, “Ten Things Wrong With the Media 'Effects' Model.” University of Westminster. Retrieved May 29, 2007. All retrieved June 15, 2015. This page was last modified on 15 June 2015, at 15:58.